After relaxing for a while in the guestroom, slip on geta (traditional wooden clogs) or zori and step into the garden of the ryokan. The garden of a Japanese ryokan features seasonal trees and flowers, with natural stones and sand carefully arranged to produce diverse scenic expressions. 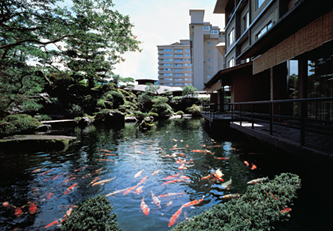 In some gardens, water is incorporated ingeniously in the form of ponds with Nishikigoi carp (colored carp) swimming majestically, or gently murmuring small streams and waterfalls. The ryokan's Japanese-style garden forms an integral part of Japanese-style architecture. Traditional architectural techniques and the art of landscape gardening are merged to create a single scenery. Many gardens are in the 'karesansui' (dry landscape garden) style, where hills and rivers are depicted without using water. Water is expressed by the patterns made in gravel, and the garden is portrayed as a sansui-ga (landscape painting). Traditional Japanese footwear such as geta made of wood, or zori made of straw or bamboo, are provided for the guests when walking inside the ryokan or taking strolls nearby.